Starring: Emily Mortimer, Gerard Butler, Jack McElhone, Mary Riggans, Sharon Small, Sean Brown, Jayd Johnson, Katy Murphy, Cal Macaninch. After “One More Kiss“, the second instalment of my Scottish trilogy is this highly underrated little gem from first time feature director Shona Auerbach. It’s a film that shows a real delicacy and understanding for human relationships and a sensitive perception of life in general. Frankie (Jack McElhone) is a 9 year old deaf boy has never met his father. His mother Lizzie (Emily Mortimer) left him years ago but never had the heart to tell her son. Instead, she concocts a story and tells Frankie that his father is working on a ship, sailing around the world. She also sends letters to Frankie, pretending to be his dad in far off places. Her story threatens to come to pieces though when Frankie discovers that his dad’s ship is due to dock at their hometown of Greenock. 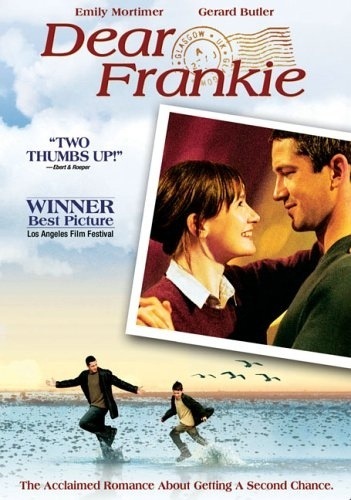 Instead of telling Frankie the truth, Lizzie employs the services of a stranger (Gerard Butler) to pretend that he’s Frankie’s father. Every now and again you come across a low-key drama with real depth and honesty that when it’s all over you are left feeling genuinely touched; a tear may even well-up or for that matter fall. This is that type of drama. It’s a film that tugs on the heartstrings but doesn’t use any form of manipulation to do so. It’s just good, honest, storytelling that uses observation and an understanding of life and the heartbreaking complexities therein. It touches on the extent that parents will go to protect their children and also the difficulties faced by broken, impoverished families. What it also does, is put your faith in the kindness of strangers. That being said, this is not a film that’s depressing. In fact, it’s quite the opposite. It’s a life-affirming story filled with humour as well as pathos and everyone hits just the right note. It’s also a film that could claim to showcase the real charm and charisma of Gerard Butler before he hopped aboard the fame train. He’s an enigmatic presence and delivers a wonderfully subtle turn that gained him a lot more recognition amongst critics and filmgoers alike. The same could be said of Emily Mortimer; she is absolutely superb as a supportive but desperate mother striving to protect her son and further excellent support is delivered by young Jack McElhone as the eponymous and gentle natured Frankie. He doesn’t physically talk throughout the film but we get to hear his thoughts through the letters he writes to his absent and elusive father. It’s through these heartfelt, emotional performances that the film really resonates. That’s not to take away from writer Andrea Gibb’s endearing screenplay or director/cinematographer Shona Auerbach’s sensitive handling of the material though; everyone pulls their weight in capturing just the right tone here. It’s a such a shame that Auerbach hasn’t made a film since as on this evidence, she certainly has the ability and a 15 minute standing ovation at Cannes would further fuel that. A sweet and poignant little drama with fantastic performances all round. A film with a head and a heart and good feel for the moment. Next up… “The Angels’ Share“. This entry was posted on October 26, 2012 at 12:06 pm and is filed under Drama with tags 2004. You can follow any responses to this entry through the RSS 2.0 feed. You can leave a response, or trackback from your own site. Again, this is series I’m unfamiliar with. But your ratings make them very intriguing. It seems to serve as a reminder that Gerard Butler can act despite a recent run of horrible romantic comedies. Good stuff Mark! His romantic comedies have been pretty dire Keith but once upon a time, Butler was a real presence onscreen. This is one of his better roles and the film itself is just a charming little delight. Thanks man. This sounds good. I’ve added it to my Netflix, Mark. Thanks. Great little film Michael. Very low-key and understated but it has moments of beauty throughout. I’d be interested in your thoughts my friend. Hope you like it. Love to see such a great review of Dear Frankie. It’s one of the very best under-the-radar films ever. And thank you, Ruth, for sharing the link with us. I don’t think I’ve ever heard of this one before now – Looks like another one to add to my list! It’s definitely worth a look Andy. It’s a delightful little film that deserves a bigger audience. LOVE this review!! Such a lovely little gem that I recommend to people left and right. Great music too, it’s a quiet film that speaks volumes! I agree with everything you said here Mark, esp. what you said about Butler. I really think he should seek out more directors like Auerbach that could make his talent shine. It’s funny that when he started out I was really wishing he’d be famous but now that he’s popular, I wish he’d do smaller films. Chasing Mavericks are being panned again by critics, I think the script is what they dislike most, which is too bad as GB’s performance is very good. I mean as a Scot, playing a surfing mentor doesn’t come naturally as you know, but he’s very convincing. Thank you Ruth. It truly is a lovely little film. While watching it my partner asked me if I ever missed having a little boy (instead of the two daughters I have). I answered her by saying a straight “No! But I miss having my dad”. There were such small attentions to detail in this film that had me welling up. Subtly and beautifully done. The music is definitely something I should have mentioned. You’re absolutely right, it was wonderful. I’m sorry to hear that, yet again, Butler is in a film that the critics are on top off. If he’s not careful, he’ll continue in this mould. It’d be a real shame if that happens because his presence and charisma thoroughly deserves to be utilised properly. I always enjoy Butler onscreen but Dear Frankie is probably my favourite – he underplays it to perfection. I’d actually forgotten about this movie, although I really liked it. Great review! I love what you said about this film being touching without any emotional manipulation. Thanks Stephanie. Glad to hear from another fan. This is a little hidden gem that more should really recognise. I just love it and if my review gets at least one more person to see this, then I’m happy. There is some emotional “manipulation” going on. You didn’t mention why Lizzie left her husband and why Frankie is deaf. When we, the audience, find out we become as protective of Frankie as she is. Let no more harm befall this boy. I loved that scene near the end where Lizzie and the “stranger” are standing in a doorway face to face without saying anything for the longest time. I swear to God(and my psychiatrist) that they were talking in my head! Great film with “indie” spirit! I didn’t mention the details of why Lizzie left her husband for a reason though man. I feel that that is such a moment in the film that people should experience for themselves. I suppose it could be viewed as manipulation but for me, it was entirely realistic and the reason for leaving had to be a good one. That certainly was. The scene your mention of the two of them looking at one another is just magnificent. Not a word uttered but I completely agree, you can hear them talking with their eyes and their looks. That’s probably my favourite scene in the entire film. Watched it earlier today. You know I’ve probably previously passed on this movie ’cause of the box cover. Had you not brought it up I probably wouldn’t have given this a shot. Great little film. I want to second the memorable scene in the doorway. What a great moment caught on film. Most directors wouldn’t have had the guts or forsight to hold the moment that long. The letter reading on the bus at the end was pretty touching too. For me kids can either make or totally ruin a movie. Gotta say the kid was pretty great. Thanks for the review. Glad to hear you enjoyed it Dave. I’m surprised you never heard of it over at Ruth’s site? As you know, she’s very keen on Gerry Butler and likes to give him a regular mention 😉 Regardless, it’s nice to hear of another fan and yes, that scene in the doorway it’s a moment of sheer beauty. You can actually hear them talking despite a word not being uttered. Totally agree on the youngster as well. Young Jack McElhone delivers a great piece of work here. I’ve never seen him since which is a shame and director Auerbach has yet to make another appearance as well. Cheers Vinnie. You should give it a go. It’s a little gem. Excellent write-up, Mark. Love Mortimer and Butler. Thanks Fernando! If you haven’t seen it you should definitely check it out. All the actors deliver lovely low-key performances.